Many people find retirement homes to be dull, sterile places. But this is not so in the case the Savina House for Veterans of the Stage in St. Petersburg, Russia, which is home to many retired actors, dancers, and luminaries of the arts. In 2006, Lucia Ganieva decided to pay a visit to the home while traveling in Russia. Built in the mid-1890s and situated on one of the islands that make up St. Petersburg, the beautiful complex consists of three buildings in a park filled with gardens, fruit trees, ponds, and walking trails, with an interior decorated with antiques. “When I visited and saw the magnificent building and spoke with the people, I immediately got my idea for a photo project,” Ganieva recalled. 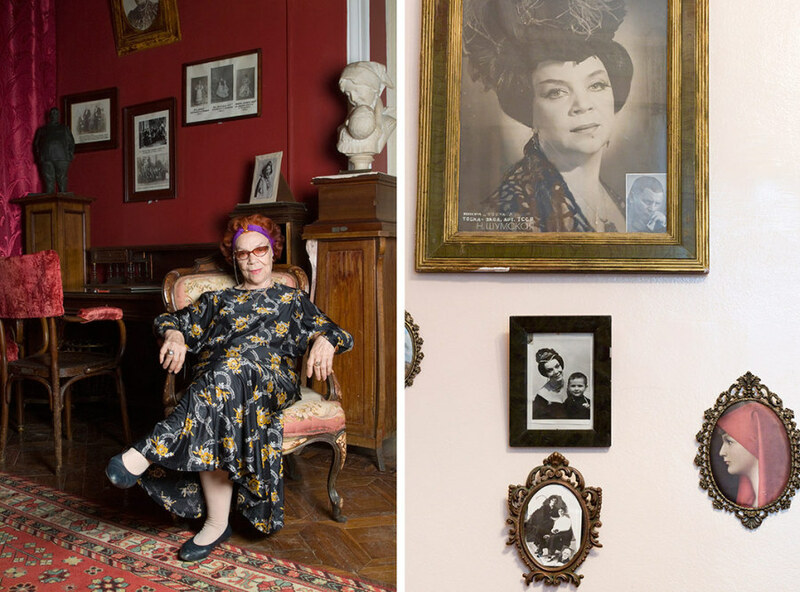 That project, “Sunset of Fame” is a series of 24 diptychs that include a portrait of the retired actors, artists, opera singers, and ballet dancers, paired with stills of their rooms decorated with memorabilia from their past. “Sunset of Fame” has been shown in a number of exhibits. In 2008 it was on view at the National Centre of Photography for the Russian Federation in St. Petersburg, and many of the residents were able to visit to see the series. Ganieva said she’s grateful to have made the project. “In in a way, all the memories of these artists have become my own,” she said.